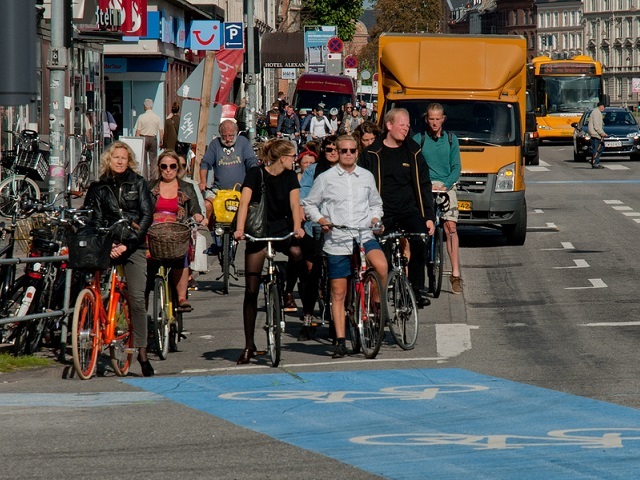 Copenhagen, Denmark, is welcoming for both pedestrians and bicyclists because of the people-centered urban design principles that Jan Gehl spearheaded. Photo by Justin Swan/Flickr. This is the fourth entry in the Urbanism Hall of Fame series, exclusive to TheCityFix. This series is intended to inform people about the leading paradigms surrounding sustainable transport and urban planning and the thinkers behind them. By presenting their many stories, TheCityFix seeks to challenge our readers to think carefully about what defines leadership and innovation in sustainable transport and urban development. Jan Gehl was originally trained in modernist architecture at the Royal Danish Academy of Fine Arts, but his wife, a psychologist, questioned him about the lack of interest architects had in designing buildings for people. Her questions pushed his work in a new direction of building for human needs; in this new direction Gehl has been a driving force in making Copenhagen a walkable, bike-friendly city, and has forever changed the way architects and planners perceive the public realm. Building upon the work of pioneers like Jane Jacobs, William Whyte, Oscar Newman and Christopher Alexander, Gehl developed the theory of human-centered urbanism, as well as a process to incorporate the principles of this ideology into urban design. Gehl’s ideas helped transform the notion of vibrant public spaces as being created by luck into a quality that can be actively fostered through good design. To come up with the priniples of human-centered urbanism, Gehl spent months documenting where and how people walked, stood, sat, and talked in places, and defining what attributes about the spaces prompted this activity. The success of public spaces, Gehl found, was intricately connected to the levels of pedestrian flow and stationary activity that prompted social interaction. Gehl found that short distances between destinations complemented by street furniture like benches encourage people to linger. He found that “soft edges” between parks and public areas, especially places where people could sit and face the pedestrian flows, created some of the most vibrant areas of the city. These observations turned into his seminal 1971 book “Life Between Buildings”. 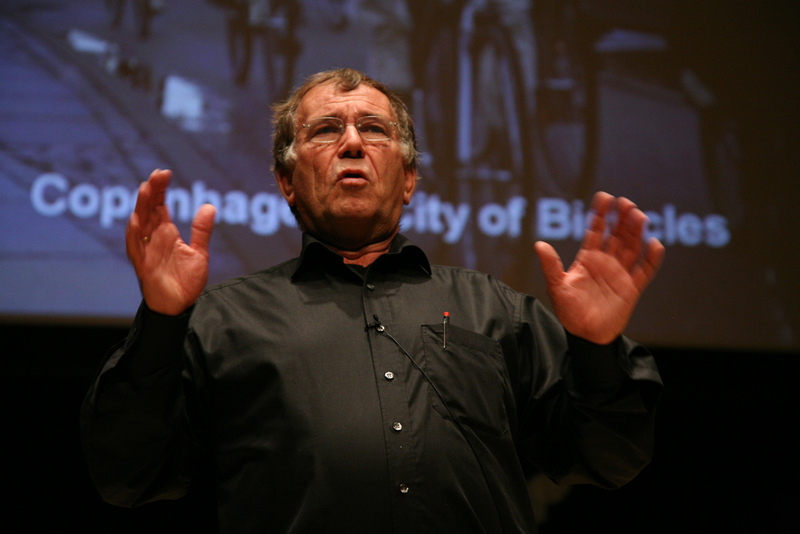 Jan Gehl has traveled across the world to give lectures to urban planners and city leaders about the potential of people-centered building to radically alter cities for the better. Photo by Gene Driskell/Flickr. Copenhagen in the 1970’s was modernizing with an increasingly car-centric mentality. Gehl was pivotal in turning around this motorization trend, creating extensive “car free zones,” including the Strøget, the world’s longest pedestrian street. Since the 1970’s, 18 parking lots have been converted into public spaces, while 7,500 café seats now provide ample room for people to mingle. Today, the transport infrastructure of the city is decidedly human-centric, with 50% of all Copenhageners commuting to work or school by bike, including 63% of the Danish parliament. Sustainable mobility has become the norm across demographics. Even 25% of families with children, who might opt for minivans in other countries, instead opt for cargo bikes in the Netherlands because they perceive it to be equally as safe as a car. Gehl’s influence on the structure of cities has expanded far past Copenhagen, both directly through the work of the architectural and design firm that bears his name and through the influence of his ideas. In his own work, Gehl has served as a consultant to city councils and city planning departments across Europe, North America, Australia, Japan, Singapore, and Saudi Arabia. He has helped former New York City Mayor Michael Bloomberg in the creation of the city’s Transport Plan and collaborated with the city of Istanbul and EMBARQ Turkey to prepare a comprehensive plan for the pedestrianization of Istanbul’s historic peninsula. Gehl’s published works include “Cities for People” (1971), “Public spaces—Public Life” (1996), and “New City Life” (2006). In these books, Gehl details several design principles that incorporate the human dimension. He stresses the importance of mixed use and active streets “at the human eye level” promoting bustling streets and in turn better neighborhood safety around the clock. Gehl notes the need for shared spaces, which prioritize pedestrian activity while still promoting bicycling and public transport. Within every facet of his work, Gehl describes the need for resource management and health to be engrained in design, from neighborhood plaza to citywide transport networks. Within his piece “Ten principles of sustainable transport”, produced jointly by ITDP and Gehl Architects, Gehl shares many insights on how mobility impacts the ebbs and flows of the city. He offers specific design recommendations: connected and small blocks, direct paths, permeable buildings, ample greenery. He also shares larger recommendations for the overall goals of cities. A central tenet of sustainability is to build for the long term, for truly sustainable cities sustain the needs of many generations. They are memorable, malleable, built from quality materials, and well maintained. If done right, Gehl insists that there is nothing in the world more affordable in the long term than building cities that provide better for people. Both the cities which Gehl has directly influenced, as well as the planners that have embraced his fervor to create close-knit, walkable communities for generations to come, argue in the simultaneous beauty and enduring value of their creations the need to create human-oriented cities. For more on the influence of Gehl’s ideas and building cities for people – not cars – check out TheCityFix’s own People-oriented Cities series. Mobility and mood: Does your commute make you happy?